Before we get onto our next Istanbul adventure – MERRY CHRISTMAS everyone. I hope you’re all having a wonderful time with friends and family. Rob and I are hosting a group of friends who are away from home for Christmas at our house in Cambridge. Should be a good day! But enough of that – back to Istanbul when we visited back in September. 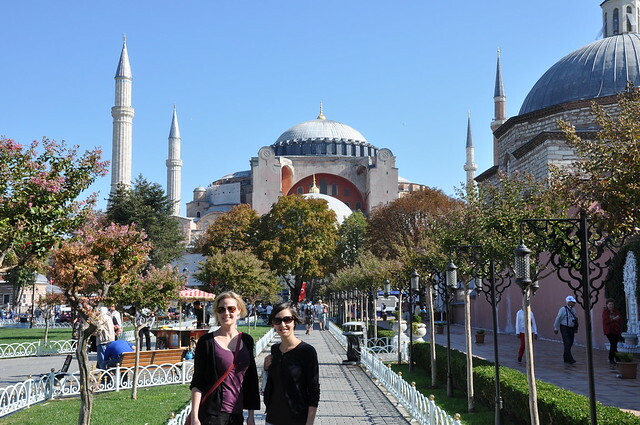 Directly opposite the Blue Mosque was the even larger Aya Sofya – a building that used to be a Greek Orthodox church, then an imperial mosque and is now a museum. It’s huge and an iconic part of the cityscape in Istanbul. 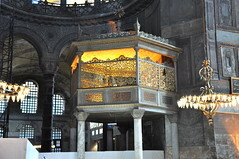 The interior is immense, and predominantly Byzantine in form and style. The Byzantine Empire was a powerful culture from the 5th to 15th centuries, mostly based in Greece. 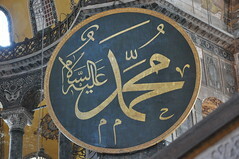 The ancient city of Constantinople was the capital of the Byzantine empire – Istanbul was built from the city’s ashes in the 15th century when the Ottoman empire conquered the Byzantine. The Byzantine era’s architectural influence is visible in many parts of the city. 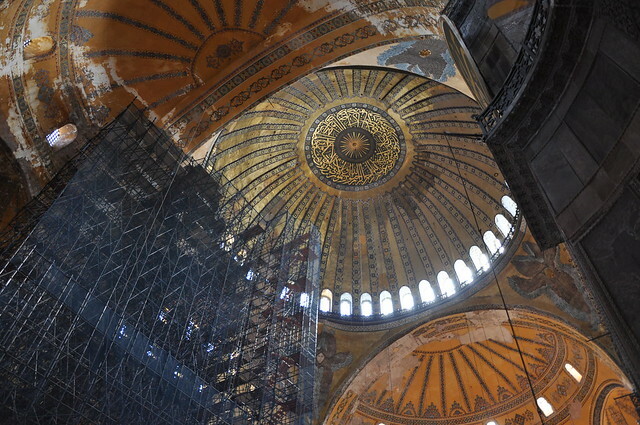 Unfortunately, Aya Sofya had a large section covered in scaffolding – this is typical, apparently. Regardless, the domes were towering and beautifully decorated. One cool thing about the history of this building was the redesign work. The Ottoman empire additions to make the church a mosque include medallions inscribed with Arabic calligraphy, a raised area where the sultan would sit for prayers and a raised seat for the Imam to address the congregation. 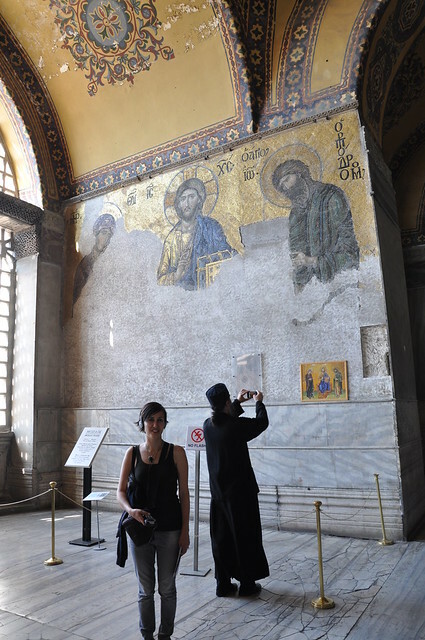 When the building was originally constructed as a Greek Orthodox church, it was during the Byzantine period. This meant the whole interior was covered in mosaics. But when it was converted into an imperial mosque by the Ottoman empire in the 15th century, mosaics weren’t fashionable anymore. So, the whole interior was covered in plaster and painted. Phenomenal. 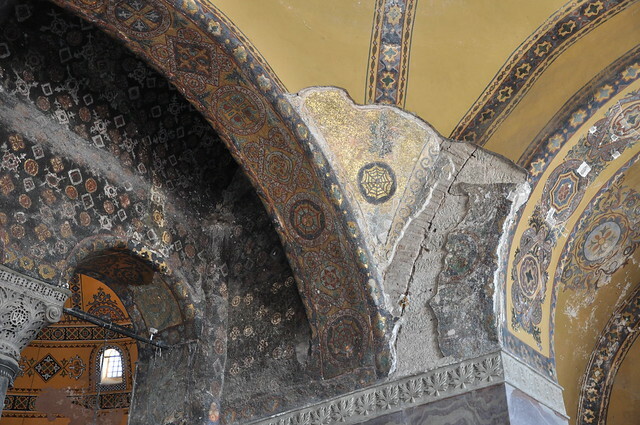 You can see where the plaster has fallen off or worn away and there are these beautifully preserved mosaics beneath. 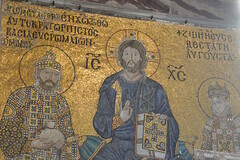 Some of the mosaics that have been revealed are some of the most famous Byzantine mosaics in the world. 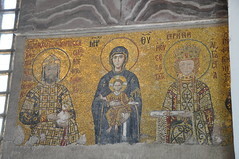 This mosaic, the Deesis mosaic, dates from 1261 and is widely considered the finest in Aya Sofya because of the softness of the features, the humane expressions and the tones of the mosaic. Despite the lower half being very deteriorated, its still a stunning mosaic. 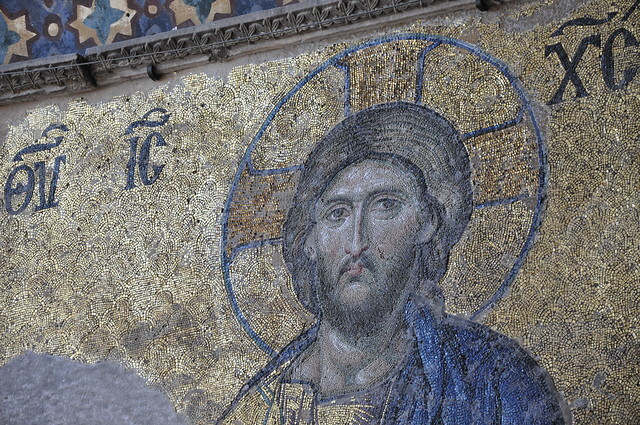 There are plenty of amazing mosaics in Aya Sofya that we can’t possibly go through them all. 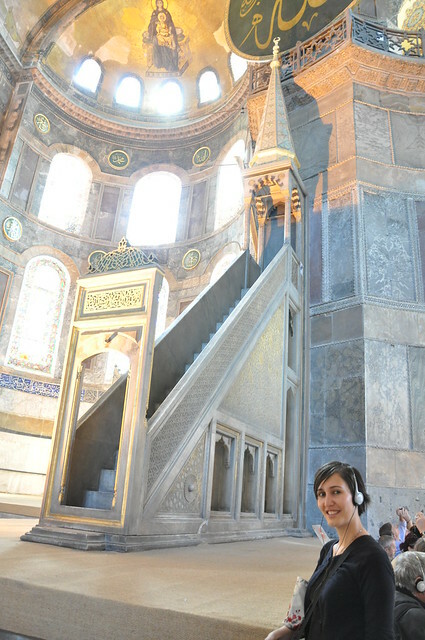 If you are ever in Istanbul, its all worth a look. 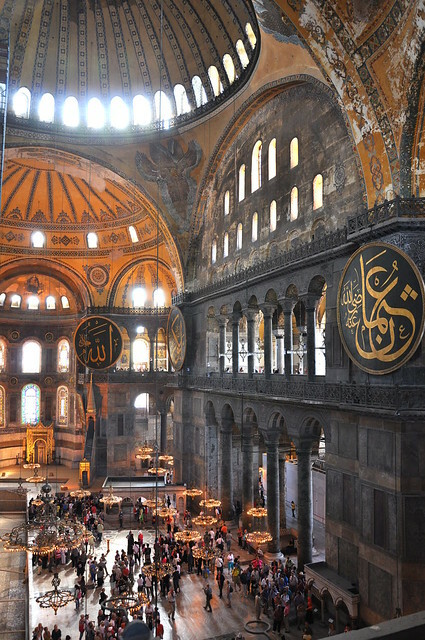 Aya Sofya is an impressive building with beautiful interior design. The audio guide at a minimum is essential because nothing in the museum is labelled. Maybe a guided tour might’ve been better because the audio guide is long winded. Regardless, it was worth the trip. Those mosaics are stunning. Our next Istanbul adventure is visiting the busy and vibrant bazaars – the market places of Istanbul.